© 2011 by Isabella Woods; all rights reserved; content may not be copied, rewritten, or republished without written permission. Make sure you choose the right type of screw for your DIY project. There are all sorts of screws and accompanying screwdrivers available at your local hardware store, and using the correct type is an important part of improving your DIY skills. Most people are familiar with the standard slot head screw and cross head (phillips) screw, but many people new to DIY dont know that there are many other types of screws out there. A simple slot screw is thought to be the first type of screw ever used, and is still used to this day even though better types have been developed. The main advantage the classic slot head screw has over other types of screws is that it still seems to be the cheapest and easiest to make. If you need inexpensive screws for a simple woodworking project that doesnt require using an electric screwdriver or cordless drill then these types of screws are fine. The problem with using an electric screwdriver with a slot head screw is that the screw bit has a tendency of slipping out of the screw head, which can lead to the slot being chewed up. A cross head screw is pretty much exactly the same as a slot head. The only real advantage a cross head has over a slot head is that it has two slots intersecting each other. If one is rendered unusable because of damage, the other slot can be used. 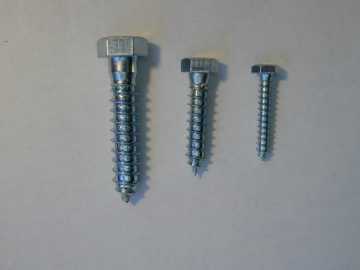 As a general purpose and inexpensive type of phillips is the drywall screw. Its a good idea to keep a couple of boxes on hand. The ones with coarse threads have more holding power when working with wood. Both these types of screws are fine for simple projects that dont require the use of power tools, but dont use them if you want to be able to easily dismantle the item you are building. Chances are you have used a hex key, also commonly known as an Allen key, before at some time or another. Hex keys are commonly found bundled with flat-packed furniture, to use with the hex screws that hold the piece of furniture together. A hex screw is a screw with a hexagon shaped recess in its head. Hex screws are very handy for constructing things that need to be dismantled and put back together again easily and without specialized tools. Just one hex key can be used to put together an office chair, desk, and even a wardrobe. If you want to move from your house and take your luxury furniture with you easily, being able to dismantle it is handy; it simplifies transportation, loading, and unloading. While hex screws are more expensive than simple slot and cross head screws, the convenience they provide you with when an item needs to be taken apart is definitely worth it. The opposite of the hex type is the lag screw. Rather than a recessed head, the hex sticks out from the head. These are generally large and are used for projects like dock construction and installing ledger boards for decks. Torx screws are another type of screw worth considering when it comes to choosing the right type for your project. This type of screw drive is referred to technically as a Hexalobular socket, but that name isnt used too often for obvious reasons. These types of screws are popular, and can be found used in all sorts of different things, from mobile phones to cars. The main difference between Torx screws and slot or cross head screws is that it has a star shaped recess with six points in its head. The advantage of using this type of screw is that it allows more torque transfer, and so is less likely to strip or cam out. Also, because torque is more easily transferred there is less need for you to push weight down onto the screw. Torx screws are a great choice if you have to use a large amount of screws to complete your project, because it will be easier to screw in each one. The main disadvantage of using Torx screws is that they are more expensive than standard slot and crosshead screws, and you will need a specialized Torx screwdriver to use them. There are times when you need to attach to masonry, be it concrete, block, or brick. The best fastener on the market for this is the Tapcon blue screw anchor system. They are easy to install; drill a pilot hole and drive them in with a hex bit in your drill.